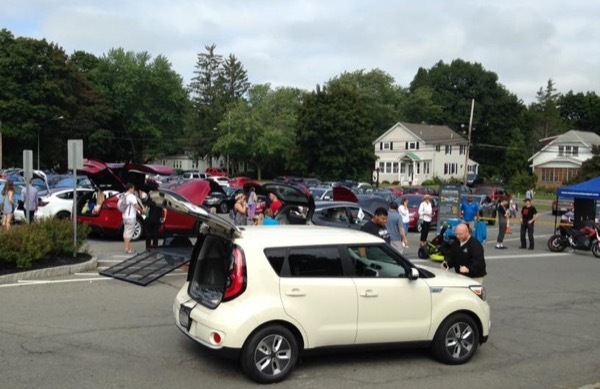 It was a perfect day for our NDEW event, the weather was great, the farmers market was buzzing, and our EV owners were busy talking to the public. In addition to the draws brought by a Model X with its wings up, we had lots of model 3's, a Zero motorcycle, and a Ryobi electric riding lawn mower. 2 dealerships came with enthusiastic sales guys happy to talk up the electric living, as they themselves drive electric. They were in and out throughout the day giving test drives to interested attendees. I dawned a dino costume (seen in the gallery) to entertained the kids, and drew farmer market patrons to the NDEW area. I am very happy how the event turned out, this was my first time being a city captain and will not be the last. In the picture we have Nick Curtis from Fuccillo Kia giving test drives and talking to Jack Riggins the youngest Tesla certified technician in the country. Tom Leonard is next to his Zero all electric motorcycle. John Necroto from NYSERDA is in the blue shirt talking to attendees about the NYS electric vehicle rebate program. 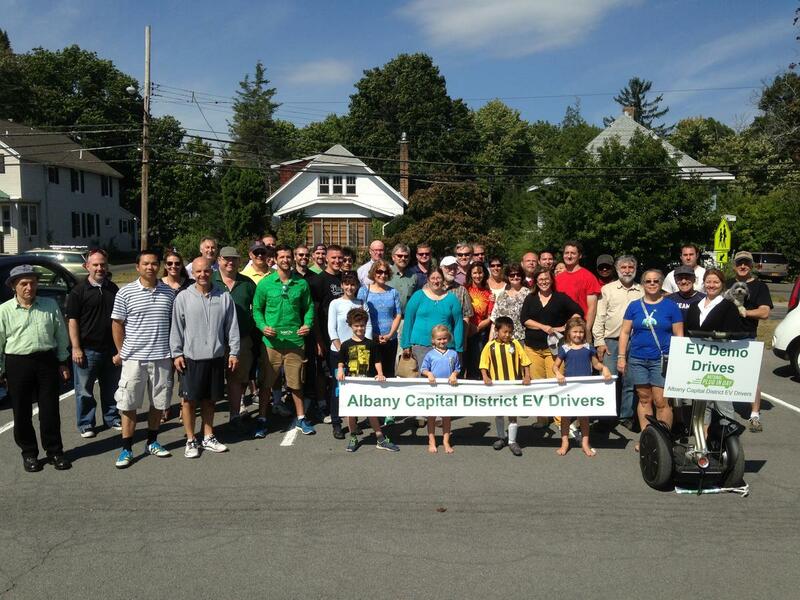 Take part in our 6th annual National Drive Electric Week event! This is an opportunity for EV enthusiasts and auto dealers to showcase pure electric vehicles to the public in a relaxed open venue free of manufacturer, technical, or political bias. The goal is to get people excited about modern EVs while giving them the opportunity to get up close and personal with them, as well as making EV test drives available from local dealers. It’s also a chance to help inform the public about electric vehicles. Like any new technology, there are still some prevalent misconceptions and lots of questions that the public has. With a range of EVs on the road, there is an electric car for every lifestyle. Local dealers will be bringing new EVs for test drives. We welcome participation from local car dealerships, EV owners, renewable energy companies, utility companies, and anyone else that is part of the electric vehicle eco-system. Take part in our EV group photo. There will be a farmers market next door with lots of delicious food. There will be Solar power vendor displays to show the advantages of making your own clean energy and savings. Registered attendees report 842,814 electric miles driven.